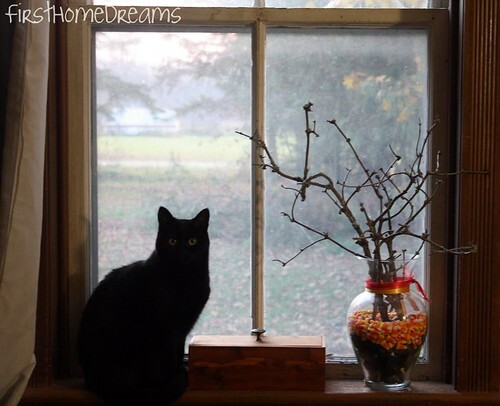 First Home Dreams: Happy Halloween! Meowzer hanging out with my attempt at fall decorating. To be honest, she enjoys biting chunks of stick off and then spitting them out on the floor. We have pumpkins outside, but didn't get around to carving them this year. It's not like we get any trick or treaters anyway living out in the boonies! Hope everyone has a fun and safe night!